Terrariums make excellent gifts for various occasions, including house warmings, birthdays and more. They give the recipient a wonderful sense of reward as the plant flourishes under their care. 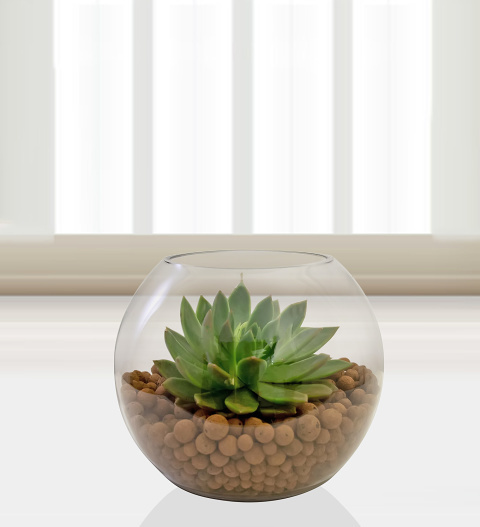 For this terrarium gift, we have selected a large succulent plant and glass bowl with a height of 16cm and top diameter of 12cm with the widest point reaching a diameter of 19cm. Along with the plant, we have also included hydroponic clay balls. Each item is carefully packaged for the recipient to assemble on delivery. The detailed care information we include makes this succulent even easier to care for.